Okay, so this could possibly be, most likely to be the last blog post for the year and what a year it has been. All those early movie premiers and movie previews courtesy of the cool folks at Nuffnang and Churp Churp. Even some free movie tickets from TGV, GSC and even from BFM.My. Even got to go to a theater show thanks to the guys and Nuffnang and Lumi Air: A Cirque Extraordinaire this year all for free. And all that helped me and this blog get well over 12,000 visitors in a little over 5 months. It really does amaze me. Not only that but I tried out for a contest and won an all expense paid trip to Macau!! Sure as heck has been an interesting year ever since this blog started. Well, for this last blog it's going to be something related to that trip to Macau that I won. See, not only did I win the trip but I also got invited to a Macanese Food Demonstration held by those good folks at the Malaysian Representatives of the Macau Government Tourist Office. 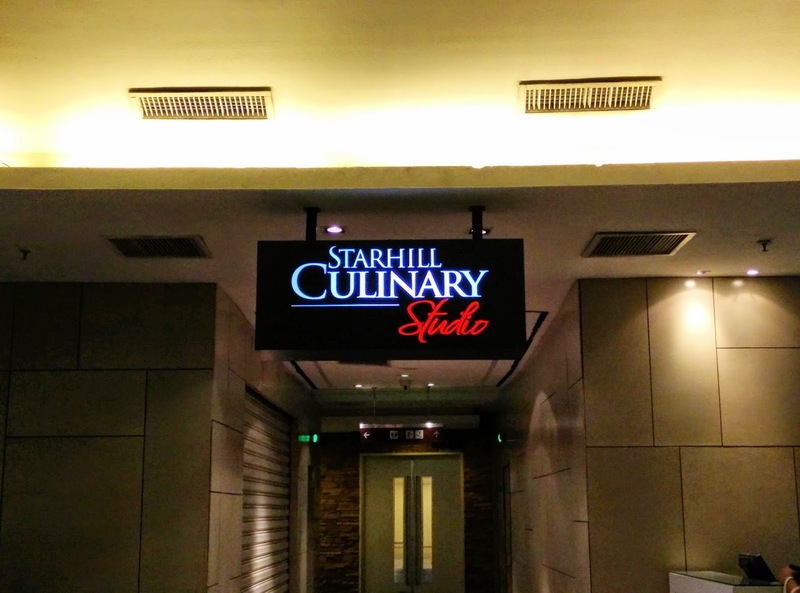 It was a pretty small affair held at the Starhill Culinary Studio with only a bunch of media journalist in attendance and a select group of bloggers. The whole point of the event was to introduce the local delicacies of Macau to Malaysians who have basically never tried Macanese food. The simple buntings to tell us we were at the right spot. What's Macanese? Well, as far as I can tell it's a fusion of Portuguese and Cantonese. Or maybe it's the adaptation of Portuguese dishes to suit local palates, namely the Cantonese community. Maybe I could be wrong. Anyway, I was looking forward to it since I had no idea what Macanese food would taste like. 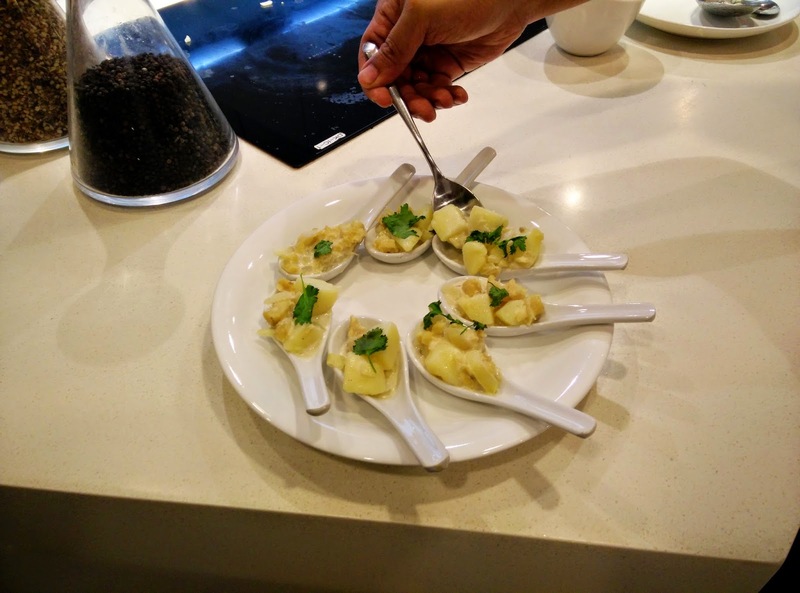 So this little Macanese Food Demonstration isn't just a one off thing. 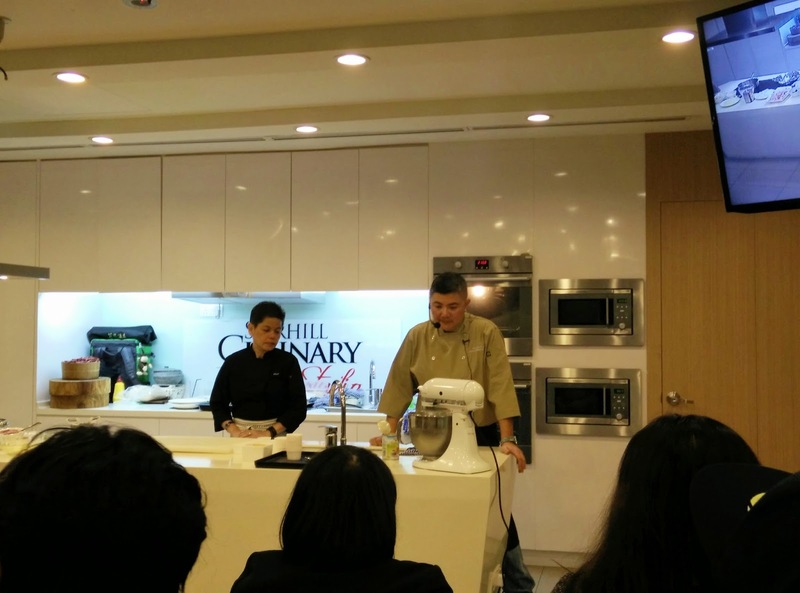 It's actually the first part of a three day event to introduce Macanese cuisine to the Malaysian public. They'll be having more tasty dishes for the public to sample at the Food and Beverage Expo being held at the Putra World Trade Centre this 19th and 20th of December. So if you are in Kuala Lumpur this weekend go check it out. There'll be food, glorious food to try from all over the world!! The Chef whipping up heavy cream and condensed milk. Anyway, so on to the Macanese Food Demonstration I went to. I arrived a little late, Kuala Lumpur traffic being the way it is, when I walked in Chef Antonieta was already starting on the first dish which turns out to be a dish I wrote about in my blog that won me the Macau Trip. Serradura. She was whipping up the condensed milk to get it all creamy in the food processor. According to Chef Antonieta it has to be done when the ingredients are chilled. It doesn't work if the ingredients aren't chilled or even if the weather the day you make it is particularly warm. 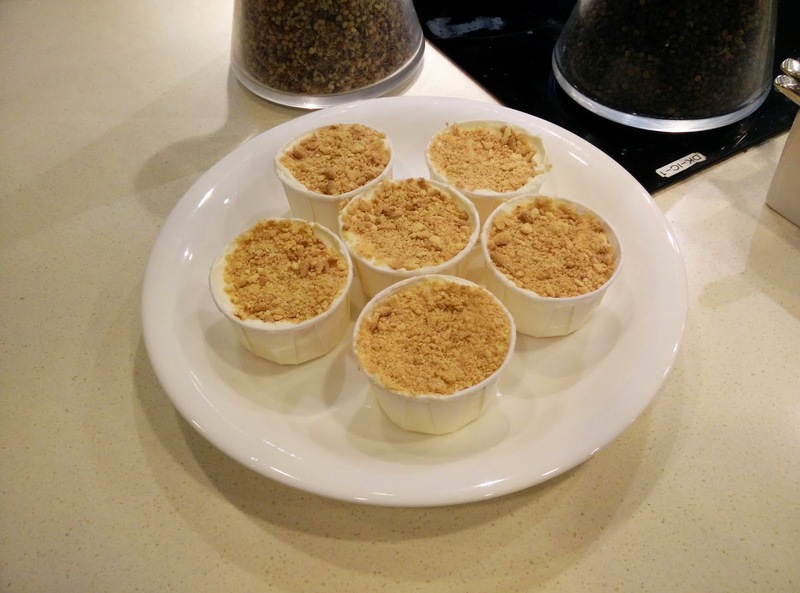 Serradura is also called Macau Sawdust Pudding, because the other ingredient that is in this sweet dessert other than whipped up heavy cream and condensed milk is just crushed Maria biscuits that look like sawdust. So to make this the things to be whipped need to be chilled first and once it's been whipped and layered with the crushed biscuits it gets chilled yet again till it's like soft serve. I tried it and man was it sweet and delicious!! The Serradura after being chilled in the freezer for a half hour. The next dish that Chef Antonieta prepared for the attendees was Portuguese Chicken. It sounds like a pretty simple dish. There's onions, potatoes, coconut cream, tomato paste and of course chicken. The chicken needs to be marinated with turmeric first though. There could be more to it but I can't remember. I do remember Chef Antonieta saying that usually they'd put a particular type of Portuguese sausage in it but she didn't have it on hand this time. How did it turn out? It was pretty tasty. Sort of like a very mild and sweet curry of sorts. Very tasty over warm rice. 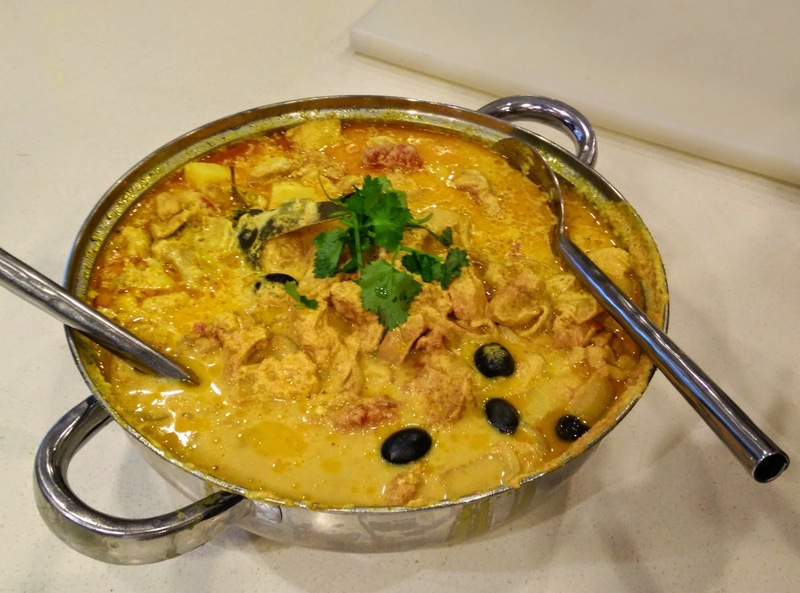 The simple yet delicious Macanese Portuguese Chicken dish. The final dish was Bacalhau which is a dish made with dried and salted cod fish. This is very traditional for the Portuguese. Chef Antonieta prepared this quite simply in a cream sauce with potatoes, onions and herbs. This I liked too. Although when I get to Macau I'd like to try the other ways that it can be prepared in. The dried and salted Cod dish. Also very tasty. So yeah, I liked what I could sample at the event. It would seem that I'm in for a pretty good treat when I go on my trip to Macau which I'll be going in early February. The other thing that was really nice at the Food Demonstration was to meet the friendly folks that organized the event. 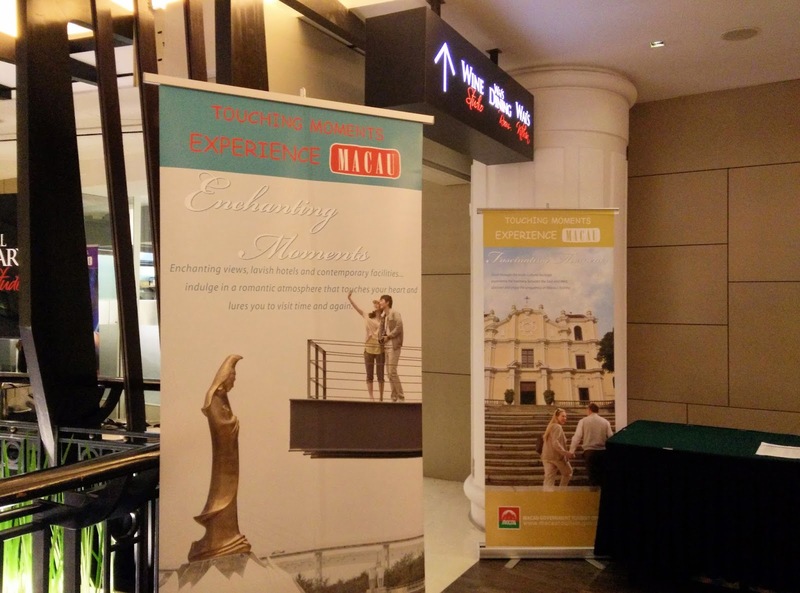 The folks who represent the Macau Government Tourist Office in Malaysia were really friendly. I've been liaising with one in particular while trying to sort out the travel details to Macau and she was there. Boy was she nice and helpful. She gave me all sorts of tips when I get to Macau and even what to try and do. Who is this nice person? Well, her name is Veron Ng and she's like an expert on Macau. I'll definitely have her contact on my phone when I travel to Macau so that I can bug her about where else to go and what else to see or eat. And if you're planning to go to Macau and need any help arranging it or getting tips on what to do, see and eat do get in touch with the folks at the Malaysian Representatives for the Macau Government Tourist Office or go to their Facebook page HERE and be sure to ask for Veron, tell her I sent you. They and Veron can be contacted here, mgto@pacificworld.travel. Well. that's it. The last blog of the year 2014. It's a simple one. Nothing special. Just something that I went to and an introduction to a place I'll be going to next year. So it's sort of a preview I guess to a future blog post. This way I'll have to keep up this blog. Also I'm looking forward to more cool movie previews and premieres and even more contests if those guys at Nuffnang and Churp Churp will let me. I hope they do. It's been a fun year thanks to them!! It was pretty interesting. Yeah Veron's really cool. Enjoy your trip too Ms Potato Queen!